Wellington, 1885. Tally Ho doesn't need to go to school because she is going to be a fisherman or a cart driver or a butcher boy like Harry Crawford. Wellington is her town and she makes up the rules. Papà takes her fishing, Nonno teaches her how to jump fences on his horse Geronimo-life gallops on the way it should, until a brother, baby William, is born. 'Go and play with your sisters,' Papà says, but wearing dresses and sipping tea is not the life for Tally Ho. Taking the advice of her hero, Harry Crawford, she runs away. Sydney, 1917. The burned body of a woman is discovered on the banks of the Lane Cove River. Was she a mad woman? A drunk who'd accidentally set herself on fire? Nobody knows, until-three years later-a tailor's apprentice tells police that his mother went missing that same weekend, and that his stepfather, Harry Crawford, is not who he seems to be. Who, then, is he? 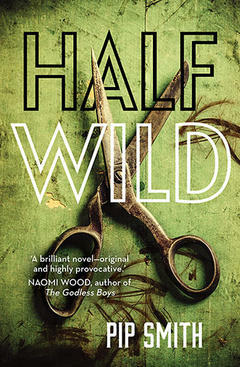 Based on the true lives of Eugenia Falleni, Half Wild is Pip Smith's dazzling debut novel.